E-Waste Recycling - What Waste is Recycled? Fortunately there are many waste items that can be recycled, and some of these are easier and cheaper to recycle compared to others. Some items are made into new products in NZ, but most go overseas where the demand for new product manufacture is greater. This is what typically happens to e-waste collected for recycling in NZ. 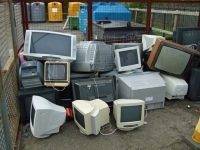 Ewaste is growing at an astonishing rate, mainly due to the introduction of new technologies. This is concerning as the waste items frequently contain an amount of toxic components. Computers, mobile phones and other electronic devices can contain toxic heavy metals such as cadmium, lead and mercury. The plastic casing and wiring of computer equipment can also contain hazardous materials, such as brominated flame retardants (a neuro-toxin!!). If this waste is not-recycled and sent to a land fill there is a risk that hazardous substances will pollute our environment by leaching from landfills into surrounding land and waterways. Leachates are produced when percolating water and other liquids pick up heavy metals and decomposing organic wastes. Uncollected leachate can contaminate groundwater and soil. Hazardous wastes can persist in the environment and enter the food chain, harming future generations. While some manufacturers promote trade-in initiatives when new products are purchased, there is no real national incentive/regulation for this to always happen. Local council rubbish collection stations often provide disposal points, and there are a number of specialist e-waste recyclers in major towns and cities who can breakdown the plastic, glass and metal components and arrange for them to be recycled into a wide range of products, typically overseas. The residual waste (i.e. not able to be recycled) is then sent to a land fill. Please use the Message Board to post any questions you may have regarding any features or functions of the recycle.co.nz website and an administrator will reply. How can I get more help regarding specific recycling matters? Please use the Message Board to post any questions you may have and a member, or administrator, will get in touch with you on the Forum. I need my waste identifying as I am not sure it can be recylced, can you help? Please use the Message Board to post any questions you may have or upload a photograph in our Photo Upload section. You first need to be a ReClub Member to load waste photos for verification: Join ReClub.